This year’s Graduation and Prize Giving Ceremony will take place at 3.00pm on Friday 22 June 2018 in Bedford Square Gardens. Please read through the information below and print a copy for your reference on the day. Each year we experience a wonderful turn out, and look forward to celebrating and congratulating all our graduates on their efforts. All graduating students attending the ceremony are entitled to two complimentary guest tickets. An unlimited number of additional tickets can be purchased for £30 each. Booking details will follow in Term 3. If you or your guests require a confirmation letter for the purposes of obtaining a visa, please contact the AA’s Compliance Officer Krishna Songara (Krishna.Songara@aaschool.ac.uk) with details of your request. A live stream of the ceremony will be available for friends and relatives who are unable to attend at www.aaschool.ac.uk/live. Academic gowns are not required, however smart or national dress is expected. In case of unfavourable weather conditions, please ensure you and your guests bring umbrellas as you will be queuing outside the garden in the open air. Guest tickets will be available for collection by the graduating student at the Bedford Square Gardens South Gate ticket desk from 12pm. At 2.15pm all graduating students are required to gather at the garden’s North Gate entrance and make themselves known to the undergraduate and graduate school coordinators. The South Gate entrance to Bedford Square Gardens will open for guests at 2.30pm. Seating will be first come first served. 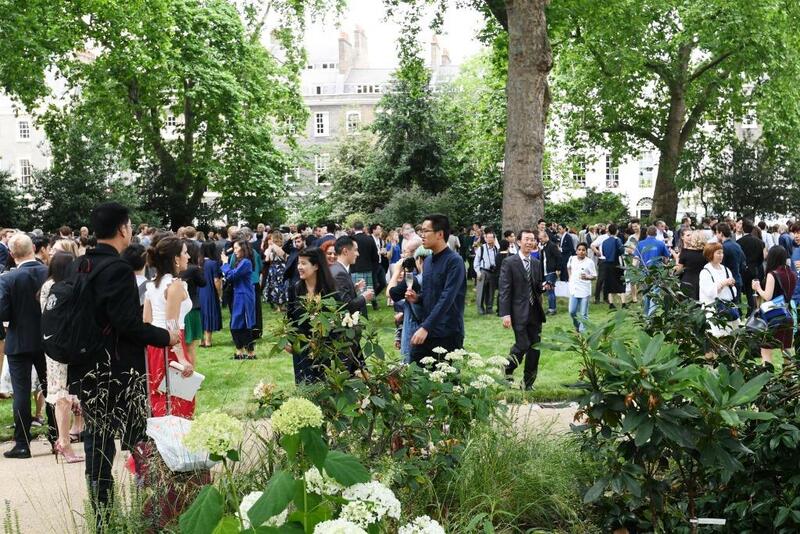 Following the speeches and presentation of awards and prizes, students will proceed to the paved area in front of 34-36 Bedford Square for the group photograph. Complimentary drinks and canapés will be served in the gardens until 6pm. Please make your guests aware that in line with UK licensing laws no drinks will be allowed outside the garden gates. The 2018 Projects Review exhibition will open immediately following the ceremony at 6.30pm. Individual photographs: From 12.30pm on the day of the ceremony, academic photographers Ede & Ravenscroft will be available to take portrait photographs of graduates and guests. They will be based in 32 Bedford Square First Floor Front and will have graduation robes on hand for individual photos. Copies of individual photos will be available to order from Ede & Ravenscroft directly. Details on how to register for your individual photos will follow in Term 3. Group photograph: A group photograph of all graduates will be taken in front of the AA immediately following the ceremony. This will be available to pre-order online when booking graduation tickets, or available to purchase after the event at the AA Bookshop. Graduation film: A film documenting graduation day will be available to pre-order at a discounted rate, or available to purchase at the standard rate after the event. If you know any non-graduating students interested in assisting on the day please ask them to contact the Membership & Alumni Office at graduation@aaschool.ac.uk. They will be paid the standard student rate, and will be entitled to attend the ceremony at no cost. If wheelchair access is required, please contact graduation@aaschool.ac.uk in advance to make the necessary arrangements. Toilet facilities will not be available in the Gardens. The toilets within the AA buildings will be available for use. Please ensure you advise your guests of this in advance. There is an NCP Car Park on Adeline Place and limited Pay & Display bays in Bedford Square. Please advise any driving guests that restrictions on resident bays are enforced 24 hours a day. Posted on June 22, 2018 May 3, 2018 by membership	Bookmark the permalink.